Back when the classic iPod was released with 160GB of memory, it seemed as if the amount of memory on Apple devices could only get better and better. Then the iPhone and iPod Touch came out and had a fraction of the memory. Sure, they’re much prettier than the rest of the iPods released by Apple, but they’re lacking all of the storage space that we all know and love. 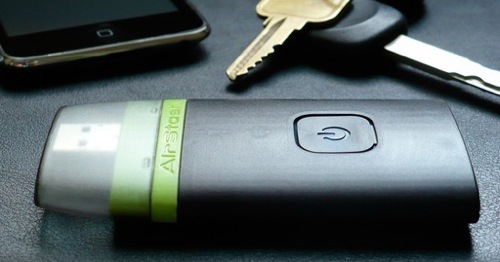 Well this AirStash is used to wirelessly give your iPhone and iPod Touch the memory boost it needs. The details are the AirStash are a little limited as of now. They’re just allowing a sliver of the information to leave you craving more on the device. Particularly how much it will end up costing you. It does promise to expand the storage of your device with a wireless memory card that takes swappable SD cards. All of this can hook up to your computer through the USB port. I imagine that details will start trickling out later this week.